Well it's been a while since I've updated my blog but now that I'm on the road again there will be a few more coming up! As you may know I was in Italy for a week and a half, traveling along the Amalfi Coast and then shooting a wedding in small Italian village where there was 4 days of shooting and planning on the villa. Since I have soooooo much content and stories from my time in Italy that will have to wait and you'll have to hop over to Croatia with me for a minute! I'll be spending more time in Croatia soon so this is just one day! I had only 2 nights and 1 full day in Dubrovnik before I knew that I would be moving on to another place. I knew that it would be busy as it's the highest of high season and also would be super hot. I made my way to the walled city of Dubrovnik and it was packed with people and selfie sticks, I did my obligatory walk around but knew that I would need to venture outside of the walls later on to get away from the crowds. I walked outside of the city walls for a bit and spotted a camera icon on Google Maps, I of course figured I'd be welcome by the sight of more selfie sticks but was surprised that there wasn't that many people at all. There was quiet benches overlooking the Old City of Dubrovnik and the crystal clear greenish-blue water below. As I quietly walked around I found some shade under a tree and below was the most beautiful sparkling blue water I've ever seen...I've seen sparkling water before but this looked even more beautiful than anything I've ever seen. I looked around and spotted some men jumping from a cliff below and across that sparking water was the tiniest white pebbled beach and a few small bars restaurants perched on the edge of the cliff opposite of me. I saw this view and knew I had found the spot where I would be spending the rest of the day. I looked on Google Maps and didn't see anything located there, no symbols of anything existing there at all. I made my way in the direction of the little beach put down my sarong on the pebbled beach, striped and got in the water. After swimming for a bit I laid half in the water and half out, placing some stones directly below my shoulders and basically gave myself a hot stone massage as the waters moved gently up and down my body. I was in complete paradise and relaxation mode. After sunbathing for a bit I made my way to the restaurant bar where I had a front row view of everything below, including a show by some expert divers, all while sipping on an aperol spritz. For those of you that know me personally and I suppose intimately know that I bruised myself badly jumping off the top of a yacht a few years ago. I jumped once (awesome! ), decided to go again and then WACK!!! (not so awesome), landed in a chair position and the backs of my legs were an eggplant shade of purple for weeks and hurt so bad from feeling so tight. I saw people cliff dive in Portugal, looked amazing but couldn't bring myself to do it. This time felt different though, there was men and women of all ages diving off the cliffs, some at the very lowest point, the highest point and in between. My goal was the in-between point and took over a good hour for me to finally take the plunge. There was a French family with their young kids diving from the spot I was contemplating. The mother finally noticed me walking back and forth and she put up her muscles and said "courage" in a very French way and flexing her muscles. I took the plunge by myself and no one else around me when I raised my head up above the water. I just smiled to myself in quiet accomplishment and floated as the sun hid behind the cliff. After soaking in the last moments of sun from this spot I made my way back into the city walls to find the literal hole in the wall, Buza Bar. 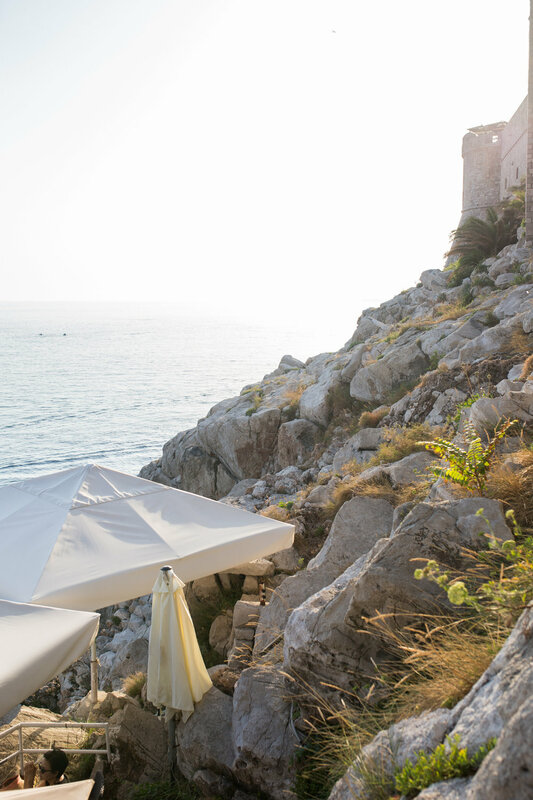 This was one of my Pinterest saves and the view gave way to white umbrellas along the cliff. I ordered myself a local beer, found there were no tables available but made my way down the stairs further where groups of people were gathered to watch the sunset and more cliff diving. I nestled my way into a little stone cove which offered the best view of the diving and the moon rising. This was a really high dive and I just kept hearing people from below say, "just jump out far enough". I'll have to muster up more courage for a dive like that one. The sun was still about to set and I really wanted to capture some golden light within the cobblestone streets of the city walls so I wandered around to capture it. 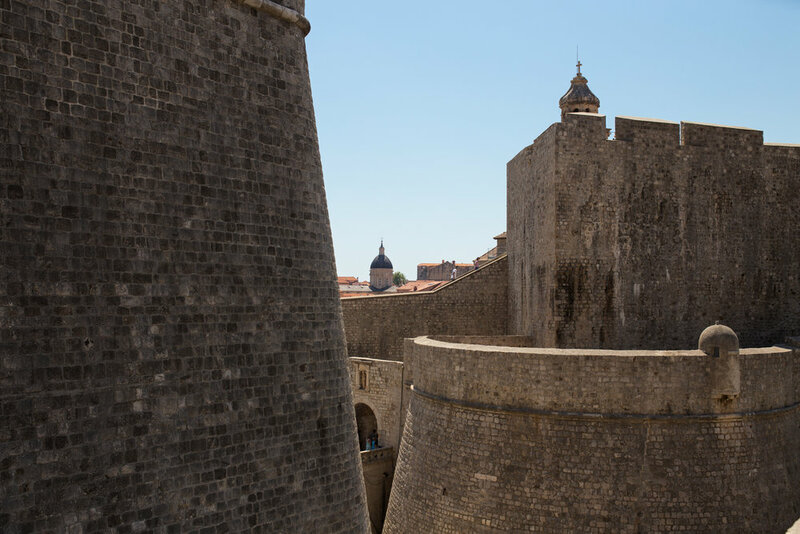 Dubrovnik is a beautiful city and would love to explore it more in a shoulder or off season. The beach spot I found has a mix of locals and tourists. I heard some of the locals asking tourists how they found it so know that it's legit. If anyone would like more information on the spots I explored feel free to send me a message!